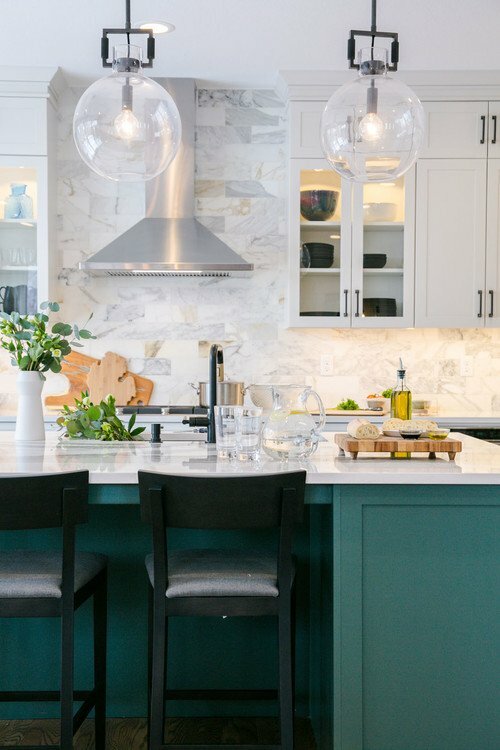 According to several well-known home decor publications, shades of green are trending in the kitchen. This is music to my ears since my kitchen wears a dark green tile floor. 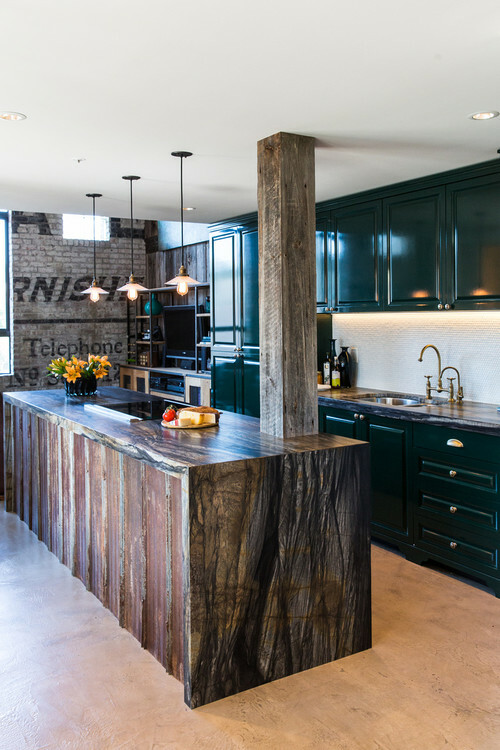 To help choose new colors for my walls and cabinets, I’m turning to the best ideas in dark green kitchen trends. 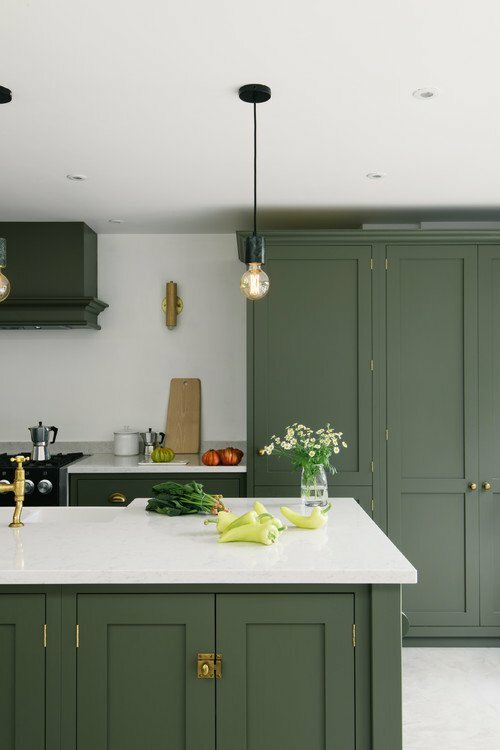 Dark green kitchen shades vary greatly so I think you’d want to choose between a hunter-type green or an olive-type green. Either way, you’ll create a powerful impact in the kitchen. 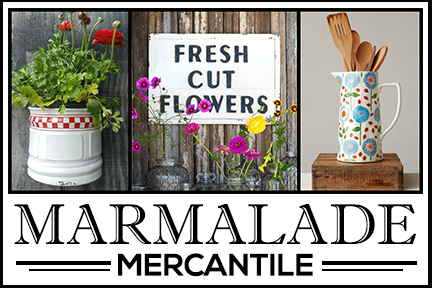 Photo by Wellborn Cabinet, Inc. 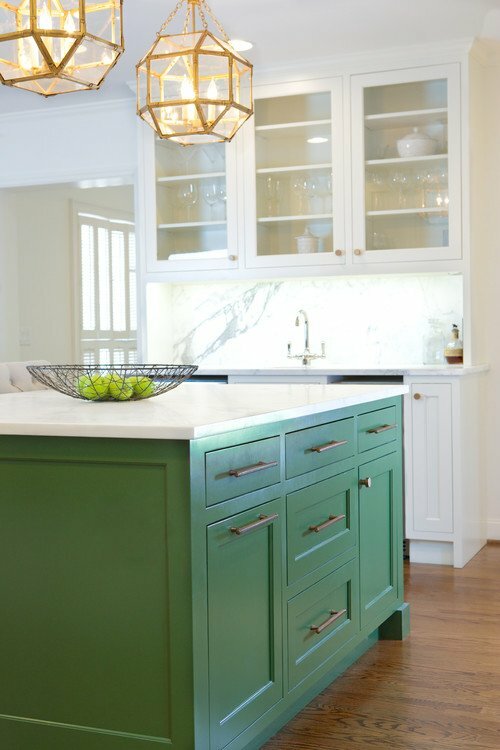 If the idea of dark green kitchen cabinets makes you nervous, test the color on a kitchen island. You might find it’s all you need. Or you might find you like the color so much you’re willing to splurge and treat it like a neutral and use it lavishly throughout the room. Some shades of green are so dark that they can appear almost black in certain lighting. I think a really dark green looks so classic and timeless. Photo by TVL Creative Ltd.
… or opt for a warmer green with a yellow undertone. 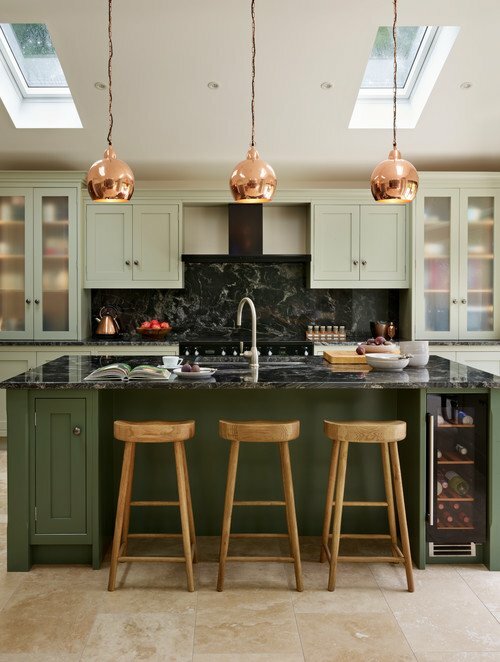 A dark green kitchen looks amazing with wood tones, lending an earthy and organic vibe to the room. 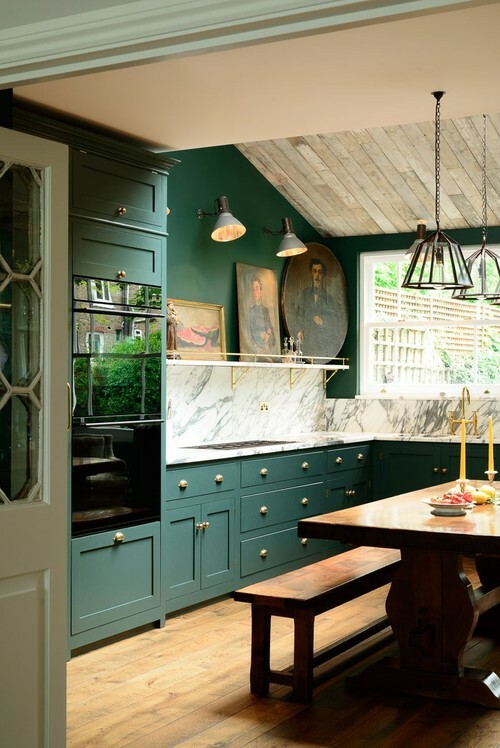 For some reason, when I think of rich green kitchens, I think of those in the U.K. like this one by deVOL. I love all of their kitchen projects! Truth be told, when I first purchased my home I wasn’t a fan of the dark green kitchen floor tiles. But then I found out they were Mexican tiles and a lot of people liked the floor. Funny how popular opinion can sway you. I’ll soon be choosing a new wall and color cabinet for my kitchen and its green tile floor. I welcome any opinions! 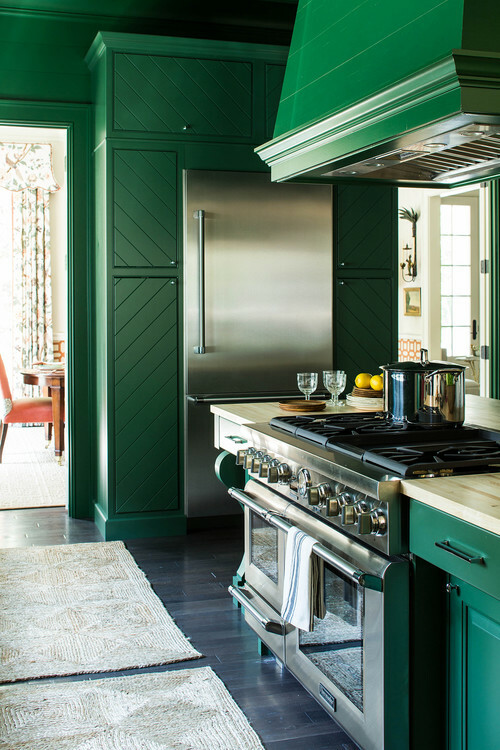 Since green is my favorite color, it was easy for me to fall in love with each and everyone of these kitchens! Wouldn’t you know, my kitchen is green too! LOL! Thanks for such a refreshing post and Happy St. Patrick’s Day this Sunday!!! 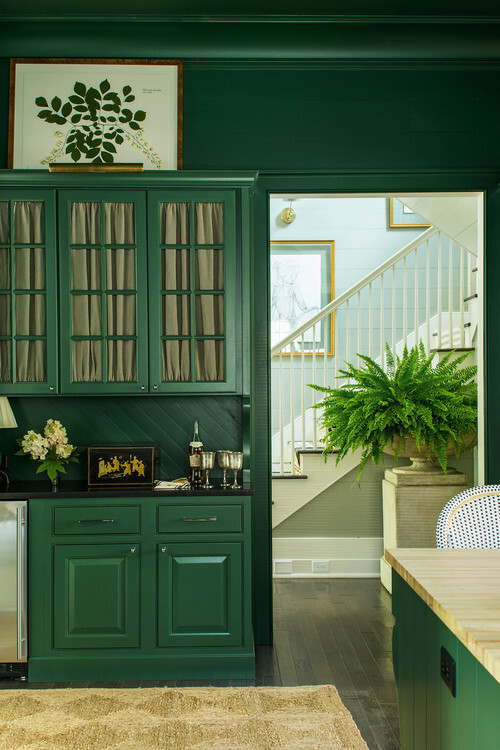 The 2 pictures of the dark green cabinets by Wellborn Cabinets, Inc. were in a Southern Living Show house that I visited in Alabama a few years ago. 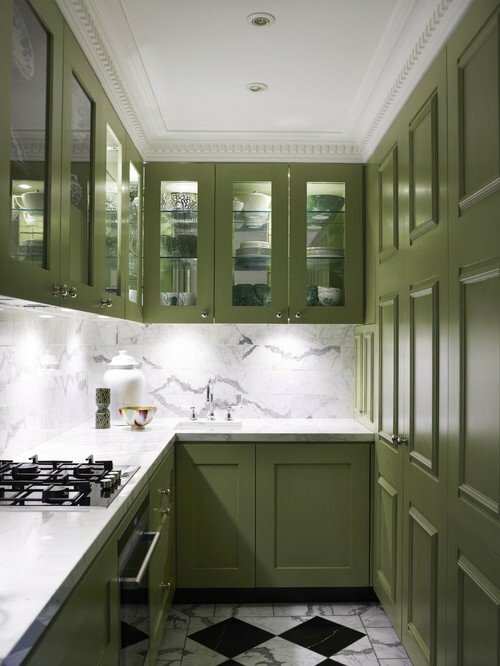 The cabinets were beautiful but the room came off very dark from the shade of green they used. Plus the whole adjoining family room was painted the same color on the walls. 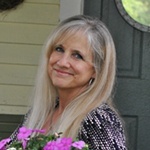 Thanks for your blog, I always enjoy your posts! I’m not a big fan of green in decor. I don’t hate it, it never has fit with our colors. I could see it as an accent for an island. I have a hard time deciding if my favorite color is blue or green but these are winners in my book! And I absolutely love your green tile floors!!!! Thanks for sharing. It’s always seemed very strange to me that I never find many people who love my favorite color – GREEN!!!! I just love green, so to see it coming back makes me smile big time. I would love to see you match the tile floor or go about two shades darker for the bottom cabinets and a shade about three times lighter for the top cabinets. 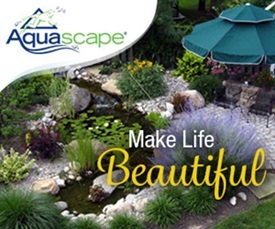 I used this combination idea for a client many years ago and it turned out to be, I think, one of my best projects. In order for the floor and cabinets to pop, you may want to consider something very light so they will contrast as in the photo of the English kitchen you like. Personally, nothing beats a shade of white in my book. Good luck! Oh, BTW, I love your tile too! 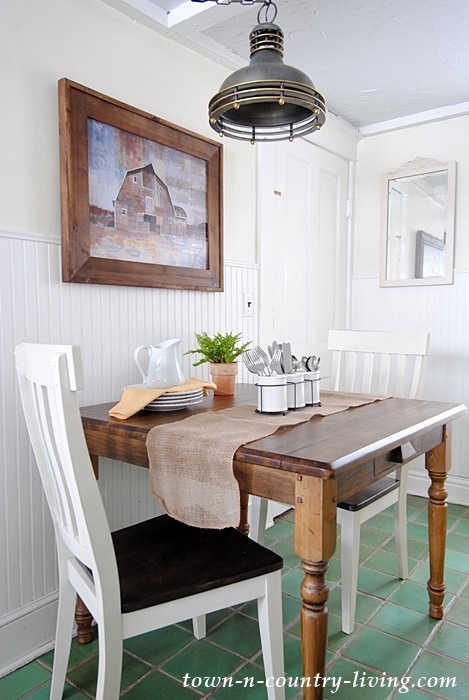 Love, love, love your green Mexican tile floors! If you are keeping your bright white woodwork, which is beautiful, I might consider a navy blue. I think it would pop with the green. 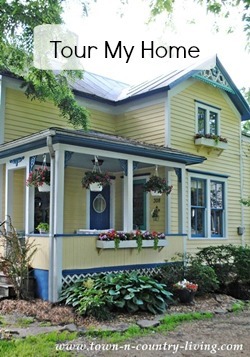 Of course, I love primary colors and can see lots of yellows, reds and maybe some browns as accent colors with the navy. Can’t wait to see what you end up doing. I really enjoy your posts. Thanks for sharing with all of us! I suggest a medium shade of gray for the walls to coincide with what appears to be gray grout in your tile floors. Then a shade of dark green suggested by the tile for cabinets — with white counter tops, baseboard and door and window trim. Or, the same gray walls, white counters and trim — with cabinets in a wood tone, but a dark green paint too highlight that amazing built-in you have in your kitchen. I’ve always loved your green Mexican tile floors and your new table and light fixture will fit with whatever you choose to do. I can’t wait to see your transformation. These were nice examples but, because i like the darker green i think i would paint my trim a pretty dark green. I have seen people who used dark shades on trim instead of the walls and it really is pretty. I love your green tiled floor. But I do like your green tile floor. That and green plants is about all I like in the color green.